Portobello caps make great mini casseroles. Here, they hold a tomato, cheese and olive stuffing that grills up to perfection. The juicy mushroom soaks up all the flavors from the lemon and soy sauce mixture. Combined with plump tomatoes and salty Kalamata olives, this dish is bursting with flavor in each bite. 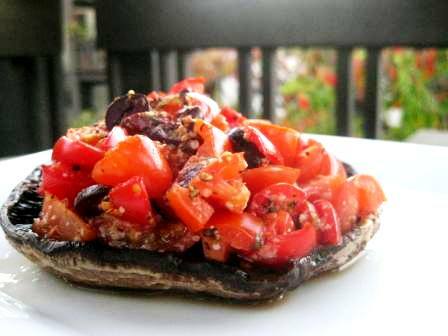 These portobello caps make great appetizers for parties or serve these with some grilled steak or chicken for an easy meal. Combine tomatoes, cheese, olives, garlic, 1 teaspoon oil, basil and pepper in a small bowl. Discard mushroom stems. Remove brown gills from the undersides of the caps using a spoon; discard gills. Mix the remaining 1 teaspoon oil, lemon juice and soy sauce in a small bowl. Brush the mixture over both sides of the caps and sprinkle with salt. Place the caps on the grill, stem sides down, cover and grill until soft, about 5 minutes per side. Remove from the grill and fill with the tomato mixture. Return to the grill, cover, and cook about 3 minutes more. Not that I know of…Try to look for energy/granola bars that don’t have dried fruits or chocolate added to them.